Go On Then So How Do I Make Compost? As it’s National Gardening Week we’re talking all this week about gardening and composting so we thought that one of the most important things would be to cover ‘how to make compost’! Gather together as much Organic Waste as possible and make a loose pile. These organic materials soon begin to heat up as the composting process starts. The volume then quickly shrinks. At this stage it is important to dig over the compost using a pitchfork, to introduce more Air into the middle of the pile. This should be done a few times at the early stages of composting as natural compacting occurs. The heat naturally generated quickly builds up again as microbes resume composting in the improved conditions. The temperature will quickly reach 130-I60F in a large well-mixed pile. This will help destroy weeds, seeds and disease and the materials will decompose much faster. Turning also subjects insect larvae and spores to lethal temperatures inside the pile, which later cools as the microbial activity is succeeded by that of worms and beetles. Add more materials at any time until the pile is as big as the space will allow or the bin is full. Check regularly. Compost should be Moist to give the best results. If it is dry add a bucket of water. If it is too wet mix in some brown or dry materials and cover to prevent more rain getting in. A well-balanced mixture of green and brown materials produces good compost. Compost will mature at less than half the original volume. Once the composter is full and the contents have stopped shrinking quickly, the compost is left to mature. At this point you can start a new compost pile. In time the contents will become unrecognisable and the mixture is then ready for use. A big well-managed mixed pile can be ready for use in a few months. An unattended pile may take about a year. It is traditional to use 3 separate units, one mature and being used on the garden, another maturing and one currently being filled. So we hope this helps you get started and here’s to lots and lots of lovely compost! Compost Awareness Week Is Here Again! Compost Awareness Week (6th to 12th May ) is all about learning how to make a difference with compost and all of us at The Recycle Works can be evangelical about compost when we want to be! International Compost Awareness Week (ICAW) is a week of activities, events and publicity to improve awareness about using organic waste as a resource to produce compost. The campaign is also keen to encourage people to put their compost to good use by trying their hand at growing their own fruit and vegetables. After all, not only do they taste wonderful, they can save you an absolute fortune year on year. Lots of events have been planned throughout the whole of the country and why not get involved in something near you? So this weekend our special offer will be dedicated to all things compost to help you produce the best compost, in the easiest possible way! This week our Brief Offer is wonderfully simple – purchase any FSC Wooden Compost Bin before 19th November and for each bin you buy, we’ll send you 2.5kg of Seaweed Meal with our compliments. A slow-acting long lasting plant food particularly rich in trace elements. It is a soil-conditioner which helps to build up the humus structure of the soil. Apply on the surface and lightly rake in up to 3 months before planting by which time it will have been broken down by the soil bacteria. Also an excellent lawn food giving strong growth and rich colour. Apply 60-120g per square metre. Simply enter SEAWEED in the Customer Code section at checkout and we’ll send you your gift! Purchase Any Compost Bin & Receive 2.5kg of Seaweed Meal* worth £6.50 for FREE! Don’t forget – simply enter code: SEAWEED in the Customer Code section when ordering. Offer only available until Monday 19th November. *Terms & Conditions – no other discount code may be used when redeeming this offer. Receive 2.5kg of Seaweed Meal for each Compost Bin purchased. Compost Bins are flying out of the factory and the small Compact Bin is proving a popular stand alone solution to all those leaves. For the next few weeks we are selling a SPECIAL Leaf Module for the Compost Bins measuring 90 x 67cm. It just slots onto the Classic Bins and can be set aside for leaves alone. Adding a length of 67cm to your Classic Bin it is a copious 0.4cu m.
We all love trees but all those leaves can be troublesome. 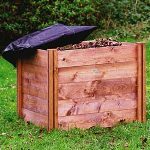 Keep them separate from your general compost in this leaf mould composter module – a simple and effective way to handle bulky leaves in autumn. We are giving an extra special discounted price of £42.00 (normally £52.00) for a very limited period only, simply enter discount code ‘LEAFMODULE’ at checkout and pay only £42. Don’t miss out as this offer won’t be around for long! Love Your Environment! Love Your Compost Bins! We’re proud to announce that Annelise’s eco-musical, Compost! The (mini )Musical, has won a National Award from Garden Organic. The musical was commissioned by York Rotters, and together with Rotters she has taught the musical to many cub and brownie groups in York. If you’d like to teach Compost! The (mini-)Musical to children or young people where you are, then Compost! The (mini) Musical Teaching Pack contains everything you need to put on a successful performance where you are! If you’d like to purchase ‘Compost’ The Musical then simply click here.